Past climates and sea levels have differed vastly from today. Fifty million years ago, ferns, cycads, and sub-tropical vegetation grew near the poles and crocodilian reptiles stalked the Arctic. Sea level was much higher. As the Earth slowly cooled, by 34 million years ago, appreciable ice began to accumulate on Antarctica and sea level gradually lowered. During the mid-Pliocene, ~3 million years ago—the last period with warmth comparable to that expected by 2100, less ice covered Antarctica and the Northern Hemisphere remained largely ice-free. Global temperatures averaged 2 °C to 3 °C above present (3.6 °to5.4 °F), carbon dioxide levels were similar, but sea level soared by 25 to 30 meters (82-98 feet)[i] (Table 1). After 2.7 million years ago, large ice sheets began to accumulate on the Northern Hemisphere. Table 1: Comparison of past, present, and future warm climates. Within the last 800,000 years, ice sheets successively spread outward and then slowly released their frigid grip across polar landscapes. Temperature and sea level varied more or less in sync with atmospheric carbon dioxide and methane[ii], as measured by oxygen isotope ratios in foraminifera (one-celled marine organisms) sensitive to ocean temperature and sea level, and trace gases trapped in tiny air bubbles in Antarctic ice (Fig. 1). During the Last Interglacial, ~125,000 years ago, when carbon dioxide stood at pre-industrial levels (~280-300 ppm vs 390 ppm today), polar summers were 3 ° to 5 °C (5.4 ° to 9 °F) warmer and sea levels 4 to 6 meters (13.1-19.7 feet) higher (perhaps even as much as 6.6 to 9.4 m)[iii]. The balmier climate was a consequence of longer-lasting and stronger sunlight during a favorable configuration of the Milankovitch astronomical cycle, when a higher tilt angle of the Earth’s axis coincided with perihelion (closest approach to the Sun) at Northern Hemisphere summer solstice (June 21). The climate effects were probably amplified by feedbacks such as increasing levels of carbon dioxide and methane, as the ice melted. At the end of the last Ice Age, starting roughly 20,000 years ago, sea level began to rise gradually at first, accelerated to 40 to 60 mm/yr during several “meltwater pulses”, finally climbing 120 meters (394 feet) from its Ice Age minimum (Fig. 2). By 7,000 years ago, the ocean closely approached its present height[iv]. Figure 2. Generalized post-glacial sea level rise curve. 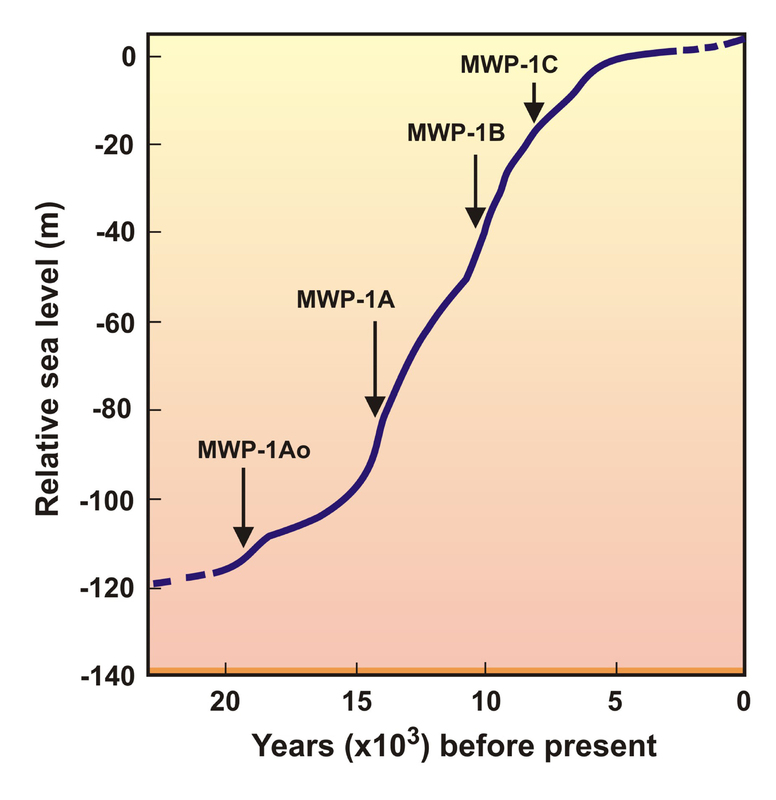 Periods of rapid sea level rise (meltwater pulses, MWP) are indicated. (Gornitz, 2009). Our planet is now heating up, largely because of the increasing anthropogenic (human-caused) greenhouse gases in the atmosphere from fossil fuel combustion and deforestation. Atmospheric levels of carbon dioxide and methane are now the highest in 800,000 years[v]. Mean global temperature has increased by 0.7 °C (1.3 °F) during the 20th century[vi]. Current temperatures likely surpass those of the past 1,000 years[vii]. The last decade has been the warmest in the instrumental period[viii]. Sea level gauges register a 1.7 to 1.8 mm/yr rise in twentieth century global sea level. Satellites detect an even higher trend of ~3 mm/yr since 1993[ix]. The 20th century sea level trend exceeds that of the last few millennia by 1 to 2 mm/yr[x]. On a centennial timescale, the two dominant processes that alter ocean height include thermal expansion of warming sea water and addition of meltwater from receding mountain glaciers and ice sheets. But sea level rise will not be globally uniform[xi]. Local to regional processes include land motions due to glacial isostatic adjustments[xii], recent geological activity, and land subsidence produced by subsurface groundwater, oil, or gas withdrawal. In addition, as the gravitational pull of a shrinking ice sheet weakens, nearby sea level drops, in spite of the added meltwater. Farther from the ice mass, the ocean rises. Ocean currents may also shift as climate changes. As carbon dioxide levels continue to rise, late 21st century temperatures are projected to resemble those of the Last Interglacial and the mid-Pliocene periods, when sea levels stood many meters higher. Although the Intergovernmental Panel on Climate Change (IPCC) Fourth Assessment Report foresees a sea level rise of 18 to 59 cm (7.1-23 in) by the 2090s, observed values already approach the upper end of climate model projections for this decade[xiii]. Semi-empirical calculations correlating historic sea level trends and temperature imply a rise of up to 1.4-1.9 m by century’s end[xiv]. Could sea level rise even higher? Although the rate of ice melt is increasing, glaciers and ice sheets probably will not discharge enough ice to raise sea level by more than 1 to 2 meters by 2100. A plausible upper bound lies near one meter, based on an average rate of ~10 mm/yr during the most recent deglaciation. How much longer will sea level continue to rise? Because of the ocean’s high thermal inertia, surface heat slowly penetrates to the seafloor, “committing” us to additional sea level rise for centuries. Furthermore, carbon dioxide already in the atmosphere dissipates gradually over hundreds to thousands of years after additions of anthropogenic greenhouse gases stop. Elevated temperatures are likely to persist long enough for significant ice sheet melting, raising sea level even further. In spite of accumulating scientific evidence in support of global warming, much popular skepticism remains. In most places (other than polar regions, mountain tops, low-lying deltas, or barrier islands), the observed changes are still fairly subtle, often overshadowed by wide day-to-day, month-to-month, and year-to-year variations in temperature, rainfall, snowfall, blizzards, and extreme weather events. We have not yet begun to experience the full range of climate change and sea level rise impacts. Prevention of a watery future ultimately involves curtailing our carbon emissions. In the interim, we can begin to adapt to the rising sea. [i] IPCC, 2007. Climate Change 2007: The Physical Science Basis. Contribution of Working Group I to the Fourth Assessment Report of the Intergovernmental Panel on Climate Change. Solomon, S., Qin, D., Manning, M., Chen, Z., Marquis, M., Averyt, K.B., Tignor, M., and Miller, H.L., eds. Cambridge, UK: Cambridge University Press; Dwyer, G.S. and Chandler, M.A., 2009. Mid-Pliocene sea level and continental ice volume based on coupled benthic Mg/Ca palaeotemperatures and oxygen isotopes. Phil. Trans. Soc. A. 367, 157-168. [ii] Brook, E. Windows on the Greenhouse. Nature 453 (2008): 291-292. Rohling, E.J., Grant, K., Bolshaw, M., Roberts, A.P., Siddall, M., Hemleben, Ch., and Kucera, M. Antarctic Temperature and Global Sea Level Closely Coupled Over the Past Five Glacial Cycles. Nature Geoscience 2 (2009): 500-504. [iii] IPCC (2007); Kopp, R.E. et al., 2009. Probabilistic assessment of sea level during the last interglacial stage. Nature 462, 863-867. [iv] Peltier, W.R. and Fairbanks, R.G. Global Glacial Ice Volume and Last Glacial Maximum Duration from an Extended Barbados Sea Level Record. Quaternary Science Reviews, 25 (2006): 3322-3337. Gornitz, V., 2009. Sea Level Change, Post-Glacial. In: Gornitz, V., ed. Encyclopedia of Paleoclimatology & Ancient Environments. Dordrecht, the Netherlands: Springer. [vii] Jones, P. D., and Mann, M.E. 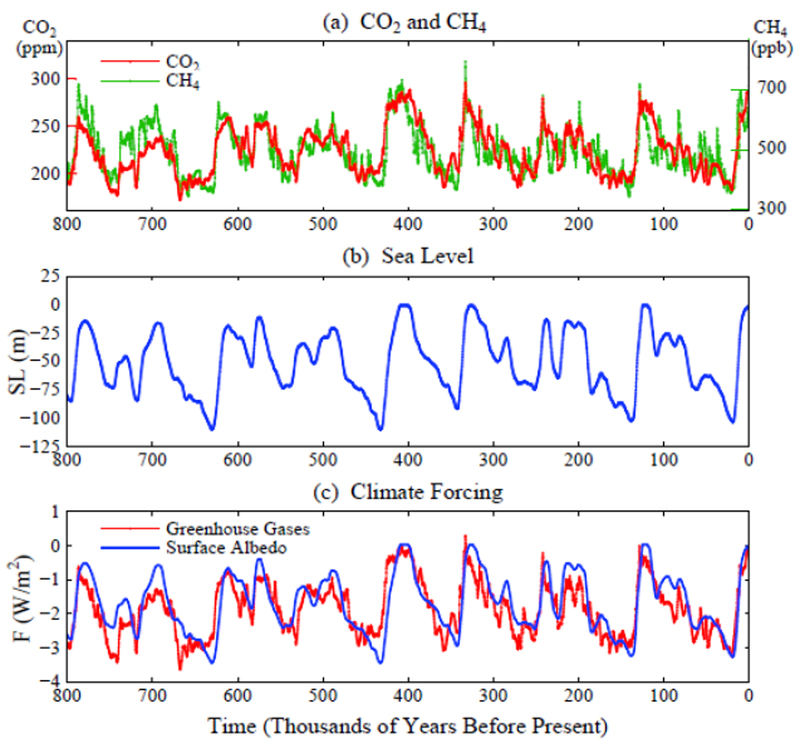 Climate Over the Past Millennia. Reviews of Geophysics 42 (2004): RG2002/2004, 42p. Mann, M. E., Bradley, R.S., and Hughes, M.K. Global-Scale Temperature Patterns and Climate Forcing Over the Past Six Centuries. Nature 392 (1998): 779-787. Osborn, T.J. and Briffa, K.R. The Spatial Extent of 20th Century Warmth in the Context of the Last 1200 Years. Science 311 (2006): 841-844. [x] Donnelly, J.P., Cleary, P., Newby, P., and Ettinger, R. Coupling instrumental and geological records of sea-level change: Evidence from southern New England of an increase in the rate of sea-level rise in the late 19th century. Geophysical Research Letters 31 (2004): L05203, doi:10.1029/2003GL018933. Gehrels, R.W., Kirby, J.R., Prokoph, A., Newnham, R.M., Achertberg, E.P., Evans, H., Black, S., and Scott, D.B. Onset of recent rapid sea-level rise in the western Atlantic Ocean. Quaternary Science Reviews 24 (2005): 2083-2100. Gehrels, W.R., Hayward, B.W., Newnham, R.M., and Southall, K.E. A 20th Century Acceleration of Sea-Level Rise in New Zealand. Geophysical Research Letters (2008): 35 L02717, doi:10.1029/2007GL032632, 5p. [xi] e.g., see Church, J.A., Woodworth, P.L., Aarup, T., and Wilson, W.S. 2010. Understanding Sea-Level Rise andVariability. Oxford, UK: Wiley-Blackwell. [xii] Adjustments of the earth’s crust to loading and unloading of ice masses. [xiii] Rahmstorf, S., Cazenave, A., Church, J.A., Hansen, J.E., Keeling, R.F., Parker, D.E., and Somerville, R.C.J. Recent Climate Observations Compared to Projections. Science 316 (2007): 709. [xiv] Rahmstorf, S., Cazenave, A., Church, J.A., Hansen, J.E., Keeling, R.F., Parker, D.E., and Somerville, R.C.J. Recent Climate Observations Compared to Projections. Science 316 (2007): 709. Vermeer, M. and Rahmstorf, S., 2009. Sea Level Linked to Global Temperature. Proc. Natl. Acad. Sci. 106 (51), 21,527-21,532. Horton,R., Herweijer, C., Rosenzweig, C., Liu, J., Gornitz, V. and Ruane, A.C. Sea Level Rise Projections for Current Generations CGCMs based on the Semi-Empirical Method. Geophysical Research Letters 35 (2008): L02715, doi:10.1029/2007GL032486. This entry was posted in climate, water and tagged carbon dioxide, climate change, glacier, global warming, ice, ice age, interglacial, melt, meltwater, Pliocene, sea level rise, Vivien Gornitz. Bookmark the permalink.